* From the Editor- “The Tree of Life” by Luis Ayala. * Tiki Special- Paul Senft brings us some great Tiki cocktails. * The Angel’s Share- Featuring Kahakai Original Tiki Spiced Rum and Blue Chair Bay Coconut Rum, reviews done by Paul Senft. * Bartender's Corner- Dr. Ron A. Ñejo talks about "Researching the Piña Colada" and also about "Essential Rum Cocktail#3: Piña Colada". 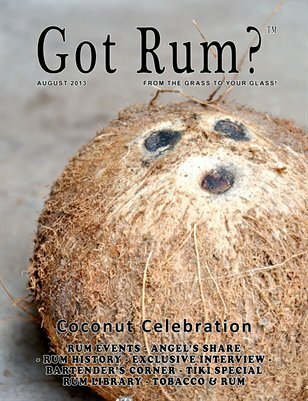 * The Rum Historian- "The Origin of Rum- A Quest, Part One: Richard Ligon's Journey" by our new addition to "Got Rum?" magazine, Mr. Marco Pierini from Tuscany, Italy. * Exclusive Interview- Interview with Mr. Jim Sargent, Founder of Haleakala Distillers in Makawao, Maui, Hawaii. * Rum in History- A timeline of what happened in the month of August throughout history from 1492– 1740. * Pairing Tobacco & Rum– Mr. Philip Ili Barake pairs up with Mr. Eduardo Molina, owner of Tea Studio located in Santiago, Chile to bring us “Tea Time”. * Rum Library - Review of “Trader Vic's Rum Cookery & Drinkery” by Margaret Ayala.